A BISHOPSTON woman is amongst the 40 people voted as making a major contribution to Bristol. Jenny Foster, Bristol's Fairtrade coordinator, now has her photo on display at the M Shed museum as part of the 'You Make Bristol' exhibition which launched on May 9. Sixty communities across Bristol nominated people for the display and made the final selection of 40 individuals or groups. The exhibition celebrates the contributions of Bristol citizens, past and present, to the character and status of the city at home and abroad. Jenny's photo is accompanied by a caption written by Roger James, regional Oxfam manager. He wrote: "Jenny is an inspiration and a beacon for Fairtrade in Bristol and the region. Her leadership and skills have built partnerships across the community, businesses and media. "She pioneered the influential Fairtrade Business Awards, Ethical Finance Conferences and the world's largest Fairtrade fashion shows. Bristol is now seen as a leading Fairtrade city with an ethical beating heart, hosting the International Fair Trade Conference in 2015." Jenny says that she was "overwhelmed" to be selected alongside other renowned and illustrious people. 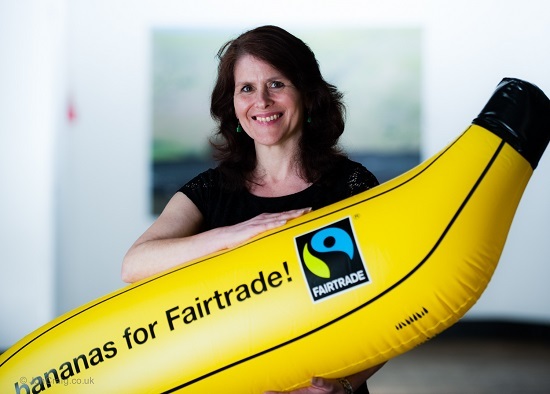 "I’m delighted and proud that Fairtrade is regarded so highly by the people of Bristol. It was an incredible thing to be voted in the top 40 - and when I received the email I had to keep reading it over and over again. "I really do love Bristol and it's fabulous to know that people feel I've made a good contribution to the city. "The fact that the voting was also community-led makes it even more of an honour." Jenny, 47, became a part of the Fairtrade movement 20 years ago. She says that it was always something she had been very interested in. Her involvement in Fairtrade began when she set up a Fairtrade cafe - Fairtrade Limited - on Gloucester Road. Through that, Jenny got involved in the Bristol Fairtrade Network. When a vacancy for Bristol's Fairtrade coordinator became available, Jenny couldn't decline. "I believe that Fairtrade is an antidote to the slave trade," says Jenny. "So much money was generated for the city during the slave trade - it's great that Bristol is now at the other end of the spectrum, and has been redefined as a fair and ethical place to live and work." Jenny is now working alongside organisers of the Bristol Green Capital in the build up to next year. "I think it's so important to get the message out there about maintaining a sustainable lifestyle. Fairtrade is such a positive thing, and it's vital that we're being conscious about the things we are purchasing." Jenny, a Bishopston resident of 15 years, says that her dream is to see Gloucester Road completely Fairtrade. "It'll be great to walk up and down the street one day and see the symbol in all of the windows." Other Bristolians featured include the world-famous street artist Banksy, Victorian engineering genius Isambard Kingdom Brunel, Michael Dillon, physician and transgender pioneer, Gareth Chilcott Bath and England rugby prop, Roy Hackett who helped lead the Bristol Bus Company boycott and founded St Pauls Carnival, Ernest Bevan, the Labour minister, as well as the Aardman animation team, renowned for their much-beloved Wallace and Gromit films.